Gallia Academy senior Justin McClelland (left) attempts a two-pointer over Jackson senior Nevan Yates (right), during the D-2 sectional final on Feb. 23 in Londonderry, Ohio. A trio of Blue Devils and a pair of Blue Angels were chosen to the 2018-19 All-Ohio Valley Conference basketball teams, as selected by the coaches from within the eight-team league. 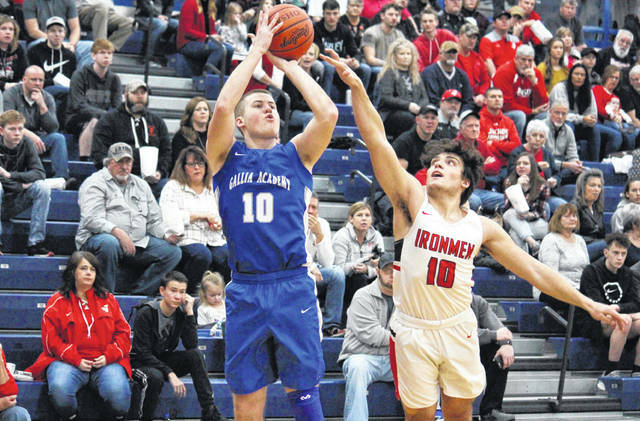 For the second straight season, Gallia Academy senior guard Cory Call was named to the OVC first team. Cal was joined on the first team by fellow senior guard Justin McClelland, who was an all-league honorable mention for the past two seasons. GAHS senior guard Caleb Henry landed on the honorable mention portion of the list for the Blue Devils, who finished fourth in the conference with an 9-5 record. This is Henry’s first All-OVC basketball honor. For the Blue Angels, sophomore center Maddy Petro was named first team, while junior guard Junon Ohmura was selected as an honorable mention. It’s the first all-league basketball honor for either player, and GAHS was seventh in the OVC with a 2-12 record. Jenna Stone, Fairland; Lauren Crum, Coal Grove; Maddy Khounlavong*, South Point; Samantha Lafon, Ironton; Blake Anderson, Chesapeake; Hannah Hughes, Portsmouth; Junon Ohmura, Gallia Academy; Makayla Scott, Rock Hill. Aiden Porter, Fairland; Reid Carrico*, Ironton; Jaylen McKenzie, Coal Grove; Caleb Henry, Gallia Academy; Brody Blackwell, South Point; Austin Jackson, Chesapeake; Danny Lattimore, Portsmouth; Logan Haskins, Rock Hill. * — indicates previous league honor.